The site was acquired by Government as a munitions factory during World War II and transferred to the Ministry of Supply in 1945 for use in the UK’s weapons programme. Ownership of the site passed to the newly formed United Kingdom Atomic Energy Authority (UKAEA) in 1954, the site than consisting of the two Windscale Pile reactors and associated facilities – with the four Calder Hall magnox reactors following a few years later. In 1971 site ownership was transferred to British Nuclear Fuels (BNFL), a company wholly owned by the Government. Found to be technically bankrupt in 2001 to the tune of some £35Bn ($70Bn) – primarily due to legacy wastes that had arisen from the site’s military work prior to the company’s formation – BNFL’s site ownership was transferred to the Liabilities Management Authority in 2002, a new nuclear clean-up body funded by the UK taxpayer and subsequently renamed as the Nuclear Decommissioning Authority (NDA). 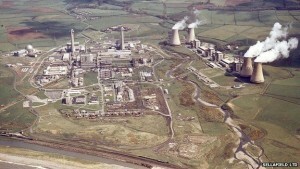 With the new name reflecting a change in emphasis from commercial operations to clean- up, the NDA took ownership of Sellafield (and other UK nuclear licensed sites) in 2005 with British Nuclear Group as one of BNFL’s four main business groups contracted to manage all site operations. In 2008, a £22Bn contract was awarded by the NDA to the private consortium Nuclear Management Partners (NMP) comprised of the US company URS, France’s Areva and UK’s Amec to manage the Sellafield site on its behalf for a contract period of up to seventeen years. In early 2015, just 6 years into its contract and following significant criticism over the mismanagement of major projects and spiralling costs, NMP was stripped of its contract and the site management role taken back into State hands through the NDA. Covering an area of approximately 2 square miles and divided by the River Calder, the site today has over 200 nuclear facilities (some 60% of the UK’s total civil nuclear liabilities) and employs a workforce of over 10,000. Crammed within the site’s perimeter fence, the layout of those facilities presents a strikingly different view today of the Sellafield site to that of the 1950’s. Site operations are regulated by the Office for Nuclear Regulation (ONR), the Environment Agency and the Office for Civil Nuclear Security. Cumbria County Council and Copeland Borough Council are responsible for site planning issues. Summary of major plant closures. The two basic Windscale Pile reactors produced plutonium for the UK’s nuclear weapons programme. Pile 1 caught fire in 1957 (the Windscale Fire) forcing the permanent closure of both Piles which are still being decommissioned today. The first of four 50MW Calder Hall reactors was opened in 1956. Their primary role was plutonium production and subsequently the production of electricity. The reactor fuel was magnesium encased uranium metal, hence the name magnox reactors. The reactors were closed in 2003 and are being decommissioned. As the prototype of the UK’s currently operating Advanced Gas-cooled Reactors (AGR), the Windscale Advanced Gas-Cooled Reactor (WAGR, otherwise referred to as the Golf Ball) was opened in 1962 and closed in 1981. Decommissioning completed in 2011. To separate the plutonium from the Windscale Pile fuel (and subsequently the fuel of the next generation Magnox reactors), the reprocessing plant B204 was opened in 1952. From 1964 it also reprocessed Light Water Reactor (LWR) fuel from overseas until a major ‘blow-back’ accident permanently closed the plant in 1973. Decommissioning of the plant is ongoing. As part and parcel of the operation of the Windscale Piles, the reprocessing processes needed to recover the plutonium from the fuel and the early operation of Calder Hall, various forms of nuclear waste were produced and consigned to what are referred to today as the Legacy Ponds. Comprised of the Pile Fuel Storage Pond, the First Generation Magnox Storage Pond, the Magnox Swarf Storage Silos and the Pile Fuel Cladding Silo, the facilities were built between the 1940’s to 1960’s and their use ended between the 1970’s and 1980’s when other waste storage methods were introduced. The ‘High Hazard’ Legacy Ponds and their ‘intolerable risk’ (with crumbling concrete walls and seepage of liquids) are expected to take decades to decommission. The more recent plant closures are related to Sellafield’s ambitions to produce MOX (mixed oxide) fuel from a mix of uranium and plutonium on a commercial basis – the fuel to be used in overseas customers’ reactors. This was seen as one way of repatriating customers’ plutonium as required under their reprocessing contracts. The first plant to be built was the MOX Demonstration Facility (MDF) which opened in 1993 and produced small quantities of fuel for Swiss, German and Japanese customers. A consignment of MOX fuel already delivered in 1999 to Japan was found to have had its quality assurance data falsified by ‘bored’ Sellafield workers. Following an investigation by the then Nuclear Installations Inspectorate, the plant was closed down. 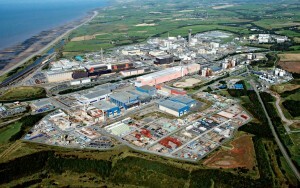 Already on the cards, and based on MDF’s experience and prior production of fuel for fast breeder reactors, the much larger – and highly contentious – Sellafield MOX Plant (SMP) was opened in 2001. Designed to produce 120 tonnes of MOX fuel per year (MDF was just 8t/yr) the plant struggled with a host of technical problems from day one and was closed in 2011 having produced just 13 tonnes of MOX fuel in nine years of operation. Subsequently described by Government as having been unfit for purpose and suffering from a workforce culture ‘not well suited to a precision manufacturing production facility’, SMP cost the UK taxpayer over £2Bn.